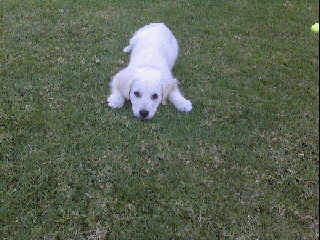 I like to run around the grass, but it is much more fun when I can make someone chase me. When I want you to chase me I run around in the grass and spin around to lay on my belly. This way I am facing you and I can watch you walk over to me. While you do this I am ready to pounce. When you get close enough I jump up, do a 180 and start running away from you, sometimes making noises while I do this. Then once I am tired of you chasing me, I come chase after you…. this is the face I make when I want you to chase me. How could you say no? I did this to my friend Zulma yesterday when she came to play with me in the early afternoon. We had a great time chasing and playing. I also make faces when I am playing with my toys. I will let you take them away because then I figure you will play with me instead. 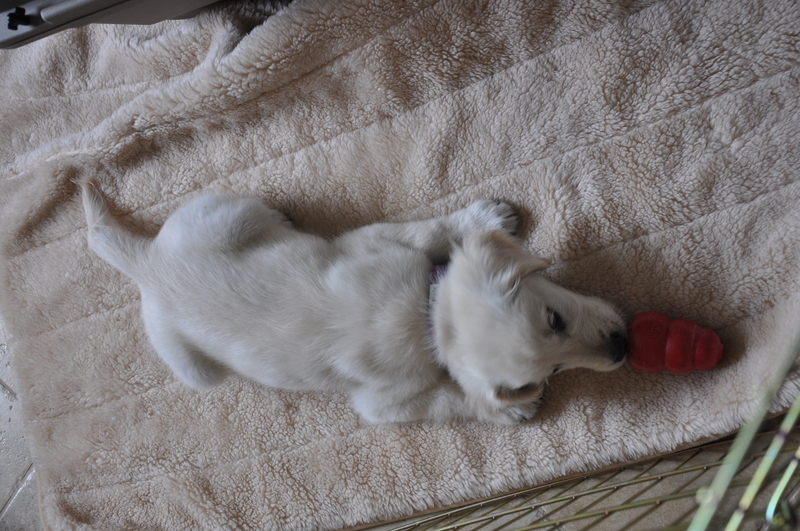 I got a Kong the other day…. it had some peanut butter in it and I was taken with that little toy for almost 30 minutes. I only got about half the peanut butter out of it, but I will most likely get better.